As surprising as the incidents described above may be, they in fact detail what has been business as usual by PETA employees for many years. PETA systematically seeks out, then kills, roughly 2,000 animals every year. Over 27,000 animals have died at the hands of PETA employees over the last decade alone. While communities across the country are ending the killing of healthy and treatable animals, with save rates as high as 98 percent, in 2011, PETA killed 96 percent of all dogs and cats and 93 percent of other companion animals such as rabbits that it took in, despite revenues of over 30 million dollars a year and millions of animal-loving members. When PETA representatives have been questioned about this killing, they’ve argued that all of the animals they kill are “unadoptable.” But this claim is a lie for numerous reasons. 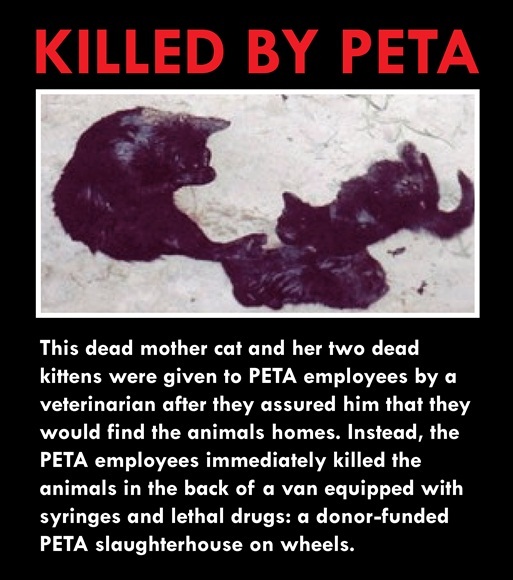 It is a lie because rescue groups and individuals have come forward stating that the animals they gave PETA were healthy and adoptable, as detailed above, and PETA insiders have admitted as much, one former intern reporting that he quit in disgust after witnessing perfectly healthy puppies and kittens in the kill room. It is a lie because there are over half a dozen shelters in Virginia where PETA is located which are now saving upwards of 90 percent of all animals they take in, while PETA, in that same state, is killing that many. It is a lie because Virginia shelters as a whole are saving 56 percent of the animals they take in, and many of those are doing so without even really trying. It is a lie because PETA refuses to provide its criteria for making the determination as to whether or not an animal is “unadoptable.” It is a lie because according to a state inspector, the PETA facility where the animals are impounded was designed to house animals for no more than 24 hours. It is a lie because Newkirk herself admitted as much during a 2008 television interview: when asked whether or not PETA kills healthy animals, she responded, “Absolutely.” And it is a lie because when asked what sort of effort PETA routinely makes to find adoptive homes for animals in its care, PETA responded that it had “no comment.” Despite the public perception of PETA as a radical “animal rights” organization, in practice, the organization is itself the functional equivalent of a slaughterhouse. PETA has long been one of the No Kill movement’s most vociferous opponents. For years, PETA has advocated that feral cats and dogs labeled as “Pit Bulls” should be systematically put to death. They have been an outspoken advocate for killing shelters, even coming to their defense when they are cruel and neglectful, as they did in King County, Washington—a place where animals were not fed, were allowed to suffer with untreated injuries, and were neglected and even abused by staff. In that case, PETA wrote a letter to King County officials that referred to No Kill advocates as “radical,” and urged the County not to give in to their efforts to reform the pound. In addition, PETA employees keep tabs on No Kill efforts nationwide so that they can undermine reformers by writing letters to the editor of local newspapers that equate No Kill with hoarding and animal abuse, and which lie about No Kill and its successes across the country. And when it comes to working at PETA, employees who have expressed support for No Kill have been fired. In some ways PETA’s behavior towards the No Kill movement mirrors that of other large animal protection groups which likewise oppose it, and while PETA also wraps the killing that they do in the language of sheltering by blaming “pet overpopulation,” PETA’s killing and the positions they take are motivated by something far more nefarious than narrow self-interest and indifference. PETA does not perform animal control for the community in which they are located. They are not under any mandate—municipal or otherwise—to operate as a “shelter.” PETA seeks out and takes in animals for primarily one purpose: to kill them. Ingrid Newkirk founded PETA after a job working at the Washington Humane Society where she killed animals. It was a job she has admitted to doing with relish, explaining how she often came into work early to do it. She has stated that she does not believe that animals have a right to live, and that, in fact, animals want to die, calling killing “a gift.” Perhaps most disturbing of all, she has recruited a legion of cult-like devotees who actively seek out then kill thousands of animals every year at her behest. It is not clear whether all PETA employees participate in the killing or just a select few who have been handpicked by Newkirk (although the silence and complicity of every PETA employee makes them as much to blame for the killing as those who actually inject the animals with poison). This fact, combined with the climate of fear and intimidation for which Newkirk is infamous—routinely sending letters threatening legal action to any animal lover who publicly condemns PETA’s killing and firing employees who support No Kill—may explain why few have come forward to provide more details. But of this much we are certain: approximately 2,000 animals cross PETA’s threshold every year, and very few make it out alive. The vast majority—96 percent in 2011—exit the facility dead when Pet Cremation Services of Tidewater stops by on their regular visits to pick up their remains. Between these visits, the bodies are stored in the giant walk-in freezer PETA installed for this very purpose. It is a freezer that cost $9,370 and, like the company which incinerates the bodies of PETA’s victims, was paid for with the donations of animal lovers who could never have imagined that the money they donated to help animals would be used to end their lives instead. * Since PETA registers as a shelter in Virginia, the PETA employees were acquitted at trial and on appeal because it is not illegal for them to kill animals, another reason why shelter reform laws are needed across the country. Please note: Photograph of Det. 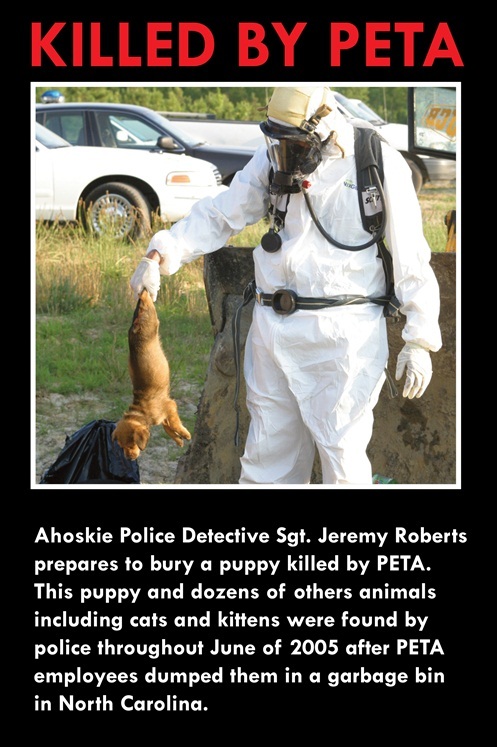 Roberts in a hazmat suit with dead puppy copyrighted by the Associated Press. All rights reserved.